If there is a sport that leads in looks and style, it’s gotta be basketball. From the iconic kicks that Jordan took the floor with every night, to the Fab Five sporting the black socks, the basketball population trumps all other sports in fashion IQ. With the jerseys, it’s no different. Basketball almost always leads the way in clean, stylish, sometimes wacky uniforms. Not all are hits, but almost every team’s fans can argue it’s best uni is the cream of the crop. Here are my favorites from each franchise. Comment below which jersey is your favorite! The Hawks’ jerseys have been on a slow decline since Pistol was in Georgia. Larry Legend didn’t ever put on a different jersey while he was in the NBA. He didn’t change teams, and his team didn’t ever change the jersey. Although I could do without the sleeves, I do like the mix of the seventies look with the current colorway. Many NBA fans wish teams would leave the pinstripes for the baseball teams, but I’m one to appreciate pinstripes when tastefully done. Larry Johnson’s Hornets took teal and pinstripes to another level. Did I mention tasteful pinstripes? Not the most famous Bulls uniform, but definitely the meanest. And isn’t that what you want from a team with a frowning bull as the logo? I might be alone on this one, but I love this jersey. It was short lived, and the Cavs decided to stay away from light blue and black from here on out, but I wish they woulda kept with it. The logo and font reminds me of the Wild West, and what’s a better look for the Dallas Mavericks? I’d like to see these back as an alternate. All the colors of the rainbow, Denver skyline, and the outline of the Rocky Mountains, and yet it worked well as a uniform. Don’t knock it until you try it. Winning helps any jersey’s cause. The Pistons had some of their best years when Chauncey and Rasheed rocked these. Sometimes, all you really need is a clean logo that honors your city. Golden State has it. This is a nice looking, clean jersey with an understated logo on the shorts. The current Rocket uniforms need to adopt some simplicity from this one. In my opinion, the Pacers have the association’s ugliest jerseys. At least this one doesn’t have the yellow and pinstripes. Maybe it’s the beautiful man that Bill Walton once was that made me pick this jersey, or maybe the lack of quality jerseys in the Clippers history. It’s a classic look that benefited from countless Hall of Famers. I don’t know what to say here. It was fun while it lasted, but please leave it in the 90’s. 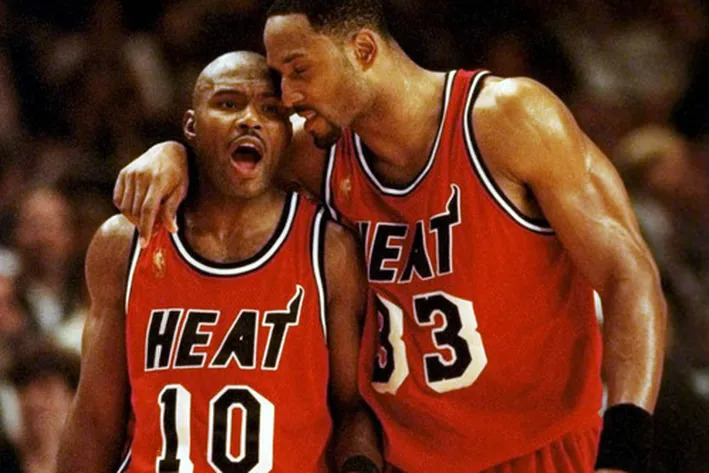 The Miami Floridians narrowly beats out the 90’s look made famous by Mourning and Hardaway. I just like the unique colors and format of this one. Possibly my favorite NBA jersey. The cream, green, baby blue and white work perfectly together, and remain understated. Just like their young team, these jerseys bring a lot of energy to the court. I grew up a Timberwolves fan, and I’ll be the first to admit that they only have a few good unis. At least KG enjoyed his prime in this one. With not many to chose from, this away uni from the Pelicans is an easy pick. Another classic, clean, and crisp jersey from the league. This jersey and colorway combo is almost as loud as Gary Payton. Almost. The glory days with Shaq and Penny had the best jerseys, too. I had to go with the classic Sixers look. Stars and stripes down the sides are a nice tribute to the city where our country was born. I’m not sure what’s brighter, Chuck’s smile or the shooting sun across the chest. This Blazer alternate is a personal favorite of mine. Still worn by Portland, this is one of the last jerseys that still has a pattern across the front. The Kings in the early 2000’s were a scary, mean team. This dark, simple jersey embodied that personality as well. There might not be a jersey that fits a team better than this one and the Spurs. It’s plain, clean, and undeniably good. Anyone who hates the Spurs knows the only reason is they aren’t their team. Frankly, this is an ugly jersey. But, it’s the best ugly jersey there is. Easily the best Jazz logo is paired with a very unique colorway. In my book, those two usually add up to be a good combo. Okay, I lied. Two sleeved jerseys made the list. This one has a lot going on with the bold, wrap around stripes, but I think it works well as an alternate. In the sports world everyone loves to hear about a comeback, the miracle play, a team going against all of the odds and getting the win. We have all heard about the Red Sox coming back against the Yankees in 2004 to win the ALCS, and the Steelers and Giants Super Bowl winning drives. Here are a few comebacks you probably never heard about. After a first half that saw Capital chasing the West offense up and down the field, Capital came out guns blazing in the second half. Starting with a 15 yard pass from Matt Reyant to Matt Miller, Capital dropped the lead to 14. Capital tacked on another touchdown with a 15 yard run by Matt Miller giving Capital hope. As time expired in the 4th quarter quarterback Matt Reyant found receiver Josh Dirks in the corner of the end zone. 20-21. Capital coach Pat Murphy has been known for being ambitious which he showed by going for 2 instead of kicking the PAT. Reyant takes the snap, fakes the give to Matt Miller, and takes off. The outcome? It’s good! Capital got the win and kept the perfect season alive with a 22-21 final score. What’s on the line? The winner goes to the FA Cup final at the Wembley Stadium. It was the 96th minute with only 4 minutes supposed to be added on but a penalty kick for Leicester kept the clock rolling. Leicester was losing 2-1 but because they won the first game 1-0 AND had the away goal rule on their side, (The away goals rule is a method of breaking ties in soccer and other sports when teams play each other twice, once at each team’s home ground. By the away goals rule, the team that has scored more goals “away from home” will win if scores are otherwise equal), they would advance whether they made or missed the penalty. Anthony Knockaert steps up and takes the shot…save by the keeper Almunia! The rebound shot…SAVE BY ALMUNIA! With a stadium erupting from the outcome of the penalty Watford started their counter. Watford pushed the ball down the right side of the field. A cross comes into the box, the ball is headed back into the middle where it meets the foot of Watford striker Troy Deeney. The result? Absolutely pandemonium. The ball is smashed into the back of the net and fans storm field, Watford players and coaches celebrating their monumental comeback, and Leicester wondering how they let the opportunity to play in the FA Cup final in Wembley slip through their hands. An absolutely awful, and I mean AWFUL, first half almost lead to an early exit by the Griz faithful. I was there and I considered calling it a day with how bad it was. Down 27 points with 5:40 left in the 3rd quarter things started clicking for the Griz as Marc Mariani took a kickoff back 98 yards started a comeback for the ages. 48-27, the Griz start the 4th quarter with a 15 yard pass from Andrew Selle to Mariani, the score now 48-34. 7 minutes left, Chase Reynolds looks for a hole up the middle but is forced outside where he scrambles to the corner for a Montana touchdown. A miracle looks possible now with the score 48-41. Only 3 minutes later Reynolds runs it in from 4 yards, which along with an extra point TIES the score 48-48. With only a minute left, quarterback Andrew Selle fakes the handoff to Reynolds, rolls out to the left and finds a wide open Mariani for a Montana touchdown. The Griz down by 27 at one point now LEADS 55-48, but that isn’t the end of the story. SDSU had one more drive….which was shut down by an interception by Griz lineman Severin Campbell who turned that into 6 points. The final score: Montana Grizzlies 61 South Dakota State Jackrabbits 48. The Miracle Minute. A comeback that most Duke fans consider the famous minute in Duke history. Maryland leading 90-80, Duke guard Jason Williams finished a layup to shave the lead to 8. Maryland inbounded the ball which was then stolen by Williams who put up a 3 pointer to trim Maryland’s lead to 5 with 48 seconds left. Duke foul Maryland on the inbound who were in double bonus. Drew Nicholas of Maryland misses the first free throw…and then the second. Duke takes the ball down the court where Williams sinks another 3 leaving 40 seconds on the clock. In a matter of 20 seconds Duke cut Maryland’s lead from 10 to 2. Maryland inbound the ball, Duke put on the trap and strip the ball away giving them 34 seconds on the clock, the ball, and a shot at the win. Duke put up a 3, no good, but they get the rebound and are fouled on the put back. With 21 seconds, Nate James steps up to the line for 2 shots. The first….good. The second….GOOD. The game was sent into overtime where Duke would prevail 98-96. Leave it to Coach K to pull off the impossible. Miracles are the best part of sports. We love seeing a team make the seemingly impossible comeback by giving everything they have to get the win. A Guide To March Madness Bracketology!! Every year, in March, when the college basketball brackets are released, there are people all over the country analyzing teams and players, trying to fill out the perfect bracket. There is no record that a person has ever filled out a perfect bracket. There is no sure fire method to the madness, but here is a guide that can help you make intelligent decisions when it comes time to fill out your bracket. A 16 seed has never beaten a 1 seed in the history of the NCAA Division One Basketball Tournament. This is not a bet that you will want to make, take every 1 seed to the 2nd round. A 1 seed makes it into the sweet sixteen 88% of the time and the elite eight 71% of the time. A 15 seed has beaten a 2 seed seven times in history. This rarity is a possibility and has happened three times in the past three years. In 2012, Norfolk State beat Missouri and Lehigh beat Duke, then in 2013 Florida Gulf Coast beat Georgetown en route to the sweet sixteen being the only team to ever be in the sweet sixteen as a 15 seed. It is still a huge gamble and probably shouldn’t be done unless you have some very strong evidence that it is a possibility. Only eighteen times in history has a 14 seed beaten a 3 seed. If you are trying to win your bracket pool this risk might not pay off unless there is a strong contender against a team that has possibly been overrated. Just recently, in 2014, Mercer beat Duke and in 2013 Harvard beat New Mexico. If you pick all of the 1, 2, and 3 seeds to advance to the next round your bracket will be looking pretty good! A 13 seed has beaten the 4 seed twenty-five times in the history of the NCAA Division One Basketball Tournament. In the last ten years there have been nine, 13seeds that have beaten the 4 seed, so keep this in mind if you are looking to pick a 1st round upset. However, since there are four 1st round games, where a 4 seed plays the 13 seed, the challenge is figuring out which game is it going to happen in, if it happens at all. In 2014 not one 13 seed beat a 4 seed, although in 2013 LaSalle defeated Kansas State in a stunning upset. Now this is where the madness happens folks. There have been forty-two times that a 5 seed has beaten a 12 seed. Since the year 2000 at least one 12 seed has beaten a 5 seed every year except for in 2007. Unbelievably in 2013 and 2014, three of the four 12 seeds advanced to the 2nd round. This definitely seems like a gamble that could pay off. It is almost a guarantee that at least one 12 seed will advance and this is where watching a lot of College ball pays off. The last three years have been particularly impressive with 12 seeds posting an 8-4 record. SFA moved on to the 2nd round last year as a 12 seed and is once again a 12 seed this year. They might be a team worth taking to the 2nd round. Notably, Montana beat Nevada to advance in 2006. Surprisingly only forty-one 11 seeds have beaten a 6 seed, which is one less than the 12 seeds that have beaten 5 seeds. In the last ten years at least one 11 seed has advanced to the next round every year. Most recently in 2014, Dayton beat Ohio State and Tennessee beat UMASS. The 10 seed has beaten a 7 seed fifty-seven times in history, which is about 40% of the time. It is a bit of a toss up on whether to pick the 10 seed or the 7 seed. It is best, in this situation, to not base your pick on rankings but to instead pay attention to who you think has been a strong contender through out the regular season. You will be hard pressed to find a harder decision while filling out your bracket than whether to pick the 8 or the 9 seed to advance. An 8 seed beats the 9 seed 52% of the time. Even though the 8 seed seems to have a slight advantage, this match up is virtually a toss up. You should base your picks on is a team has had a really hot player or finished their season really strong. Rankings seem to have little to no predictability when it comes to the 8 and 9 seed. Like I stated earlier, a 1 seed makes the sweet sixteen 88% of the time, 2 seeds make the sweet sixteen 68% of the time, 3 seeds make the sweet sixteen 60% of the time and the 4 seeds make the sweet sixteen 58% of the time. The last five times that Georgetown has been in the tournament, they have lost to a team ranked at least five spots worse than they were. So they could be one team to choose for an upset against Eastern Washington. Although all of the 1 seeds are a heavy favorite, there has only been one year in history, 2008, that all of the 1 seeds made the final four. Only six times in history has the championship game featured two 1 seeds. Only three times in history, most recently in 2011, has a final four not featured a 1 seed. Among active coaches in the NCAA tournament this year, Duke’s coach Mike Krzyzewski has won 4 championships, followed by Louisville’s coach Rick Patino and North Carolina’s coach Roy Williams and they have both won two. Other active coaches in the tournament that have won a championship include SMU’s Larry Brown, Kentucky’s John Calipari, Michigan State’s Tom Izzo and Kansas’s Bill Self. A 1 seed has won the championship five of the last six years. A 2 seed has not won a National Championship since 2004. A 5 seed has never won a National Championship. Only four times in history has the winner of the National Championship been worse than a 4 seed, in 2014 Connecticut as a 7 seed, in 1988 Kansas as a 6 seed, in 1985 Villanova as a 8 seed and in 1983 North Carolina State as a 6 seed. A 12 seed or worse has never made the final four and has only once made the elite eight, which happened when 12 seed Missouri made it in 2002. Of the teams in this years NCAA tournament, nineteen of the sixty-eight teams have won a National Championship in their school history. UCLA has won eleven championships, Kentucky has won eight and North Carolina and Indiana have both won five National Championships. Although Kentucky is a heavy favorite, only three times in the last twenty years has the topped ranked team in the country won it all. However the last time it happened was in 2012 and Kentucky was ranked #1 and won the tournament, so there is a good chance that they will do it again this year. What follows is a link to where you can go to print off a bracket. There are so many outlets out there where you can enter into bracket pools that you should have ample opportunity to have some fun this march madness season. I hope this breakdown of odds will help you when making your predictions. Good Luck! !